Great things our wonderful customers have to say about our services. We had 7days tour of Italy – Rome, Assisi, Loretto, Lanciano & San Giovanni Rotondo. The driver Leonardo assisted us in every possible way and made our journey safe, comfortable and relaxing for the group. Very Professional driver. On behalf of the Group, I say Thank You Leonardo. Very profesional, nice driving..One of the best driver in europe..
Had a wonderful n memorable 7days Italy trip – Rome/Assisi/Loretto/Lanciano/San Giovanni Rotonda – all made possible with Leonardo. Professional driver. Thanks Leonardo for making our trip special n special thanks for ur patience We made new friends too. Leonardo, do expect us back soon to explore the other interesting places with you! Great service! It’s been kind, available, punctual and organised! Finally thanks to him we have solved the problem of the ascent to the health center of San Giovanni Rotondo for my grandmother that not very much! On time, available, fast and reliable. Traveling from San Giovanni Rotondo to Naples in comfort and without any discomfort. Five Stars and totally recommended! Educato e molto disponibile e cortese ci ha aiutati a visitare il Gargano molto molto bravo. 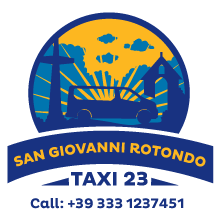 Taxi San Giovanni Rotondo. Copyright © 2016.